Bader is a very pretty 1 year old Amstaff Plott Hound mix dog. She has amazing light green eyes set like jewels against her light red brindle and white coat. Super smart and extremely affectionate, Bader is a freind to everyone she meet. She loves people of all sizes and shapes, and is even friendly with cats. Occasionally Bader meets a dog that is not to her liking, but generally gets along well with other dogs, particularly dogs she is familiar with. She is a very healthy, spayed, vaccinated, house broken and crate trained dog. She would be an ideal candidate as an emotional support dog. Bader has a fair amount of energy, so does need owners who are active and can give her a good daily walk or run. She is a wonderful young dog that deserves a very good home. Please adopt Bader today. All supplies and vet records will be included. $150 Adoption Processing Fee. 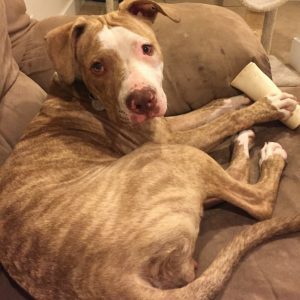 If you are looking for a very pretty, very unique young female mixed breed dog for adoption in Seattle, Bader is looking for you! This very stunning girl has a light blonde brindle and white coat. She weighs 45 pounds and is slender and athletic. Bader is so smart. She learns well and is eager to please you. She loves humans, and gets along well with cats and children. Bader is a lovely mix of Plott Hound, American Pit Bull Terrier and American Staffordshire Terrier. She is such an affectionate, playful, curious and sweet young dog. At just 1 year old, she has already had some training, and with more intensive training, Bader will become the perfect family dog. She is best suited for a home without other dogs. She has occasionally shown an tendency towards aggression with other dogs. She is loving and sweet with dog-friendly cats. Her best friend is a cat, and they love to cuddle together. Bader’s owner loves her very much. Unfortunately she has developed chronic back problems which make giving Bader the exercise she thrives on very difficult. She is also very busy with her work schedule, and feels strongly that Bader would have a better life with a family who have more time and energy to devote to her. Bader will be rehomed with all supplies. She has been fixed, vaccinated, micro-chipped and is ready-to-love. She will even be rehomed with all supplies. Please offer Bader the active, loving home she needs and deserves. She can’t wait to cuddle with you! Behavior Issues: Yes She is very friendly but can be aggressive towards other dogs. I’ve experienced her randomly assert her dominance and pin other dogs unexpectedly. She’s never bitten a dog or broken skin, but can be intimidating when she growls. Accessories Included: A wonder-harness, a good leash with accompanying poop bag dispenser, as much dog food as you need, a kennel, all her toys, puppy pee pads. It’s me, my cat and Bader. I work a lot though and so she has to spend a lot of time in the kennel. I have a big back yard, but she needs to be able to go on longer runs and I can’t do that because I have back problems. She is currently allowed on the furniture and in the bed, but I’m trying to adjust that. But she truly loves being able to cuddle under covers, in bed with those she loves. It’s just me and my cat Rocky. She does really well with the cat. They’re friendly and cuddle together. I work a lot so have to be gone for hours at a time and that doesn’t work well for a young pup. Bader is super affectionate and pack-like so I think needs a family with more people around more often. Baders Favorite Toys, Foods, Activities? She loves fetch, cuddling with family, chewing things (all things!!! including bones, toys, furniture etc), hiking, car rides, swimming etc. I had to leave Bader for one weekend and was gone for 2.5 days – when I came home after that during which time a dog sitter had watched her I let her out of her kennel and she hugged me for 30 minutes straight. She put her arms over my shoulders and laid her head on my shoulder with her tummy on my front and she staid there for almost 30 minutes – she clearly really missed me and just wanted to hug each other. That same night she slept cuddled under the bed with me with me spooning her. Why is Bader Being Rehomed? Bader needs more extensive training than I am able to give her. She has some aggressive tendencies that need to be monitored and trained for and I recently got a new job that takes way too much of my time. 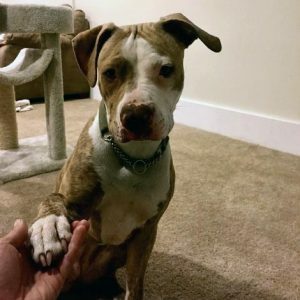 Bader is one of those dogs who would be an amazing family pet because she loves attention and cuddling and human contact, but she also requires training and consistency. I am a single woman with a demanding job who travels a lot and I just can’t provide her with the environment in which she would be the most successful. I want a family who has the time and energy to devote to training her properly so as to bring out the best in her deeply loving and sweet, outgoing spirit while ensuring she learns good habits. 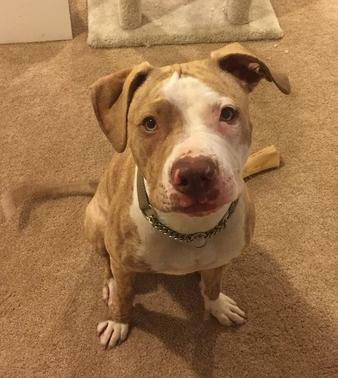 I want to ensure she has a family that has enough time to spend with her to help her overcome some of her insecurities from childhood (she has some separation issues from being abandoned as a pup) and be the best version of herself she can be. 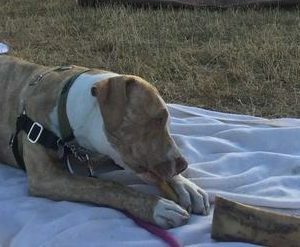 If you are interested in adopting this special Pitbull Plott Hound Amstaff mix dog For Adoption in Seattle WA, please fill out our online meeting request here. Once received and reviewed, our staff will ask the pets owner to reach out to you and arrange a meeting to determine for certain if Bader is a good fit for you – and you are a good fit for this pet. Georgetown, WA. Adopt this sweet mixed breed Dog today. 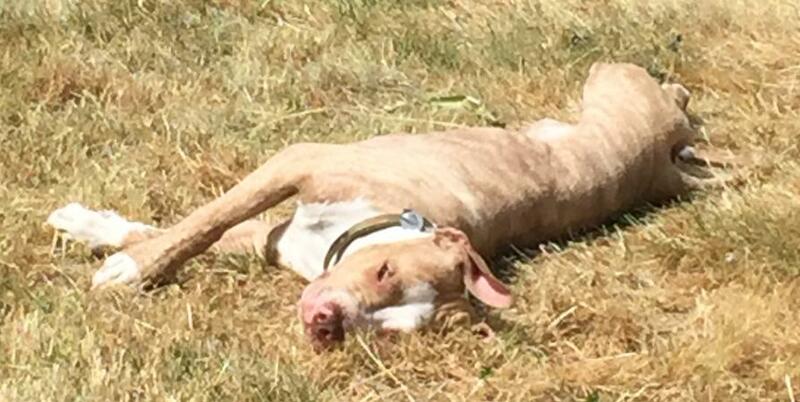 Finding good homes for preloved dogs, cats, puppies and kittens throughout Washington.